There’s more than a touch of The Lord Of The Flies, along with the usual dose of now-fashionable Gnostic musings, to this adaptation of James Dashner’s YA sci-fi potboiler. There’s nothing too original going on here, but first time feature director Wes Ball keeps things moving along at a decent clip, giving us likeable, distinct characters to follow through a familiar but robust and fast moving story. The young cast are the film’s best asset, each imbuing hastily sketched characters with enough personality and likeability to make them more than just generic ciphers. Dylan O’Brien, notable for not much other than the recent supernatural romance TV reboot of Teen Wolf, shows off leading man chops. Will Poulter is saddled with the potentially thankless role of Gally, Alby’s right hand man who is suspicious of Thomas’s boat-rocking antics, but delivers a performance that goes beyond cardboard cut out villainy. Even young Blake Cooper, who plays comic relief tubber Chuck, brings a lot of pathos to the table. The film also goes a lot darker than might be expected (there’s an argument to be made about Minoan sacrificial imagery in YA fiction, with both The Maze Runner and The Hunger Games echoing the myth of the Minotaur). Ball’s film has a body count and it doesn’t shy away from killing off some of its cast in quite brutal ways. Add on to that the nightmarish Grievers – spider-like biomechanical monsters that roam the Maze after dark, killing anyone they come across – and you’ve got a movie which is most assuredly for teenagers, not children. 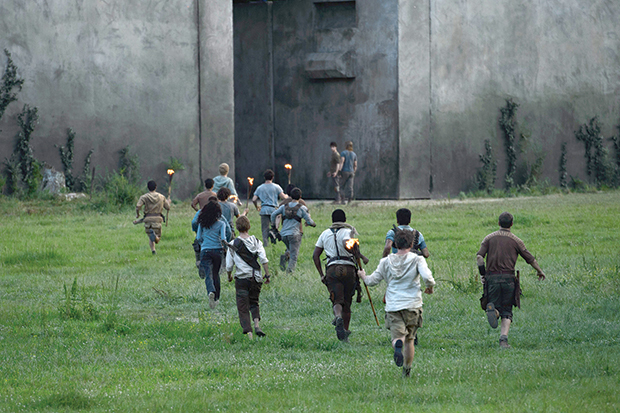 The Maze Runner’s key problems are its lack of originality – a reasonably well-read teen will surely be familiar with all the sources the film is cribbing from – and the fact that, as seems inevitable these days, it’s more interested in setting up a franchise than telling a discrete story, ending in a big, clumsy info dump and sequel hook that is ultimately dissatisfying. Still, up until that point it’s a solid, fast moving, entertaining slice of dystopia; if that’s your jam, you’ll be well served.